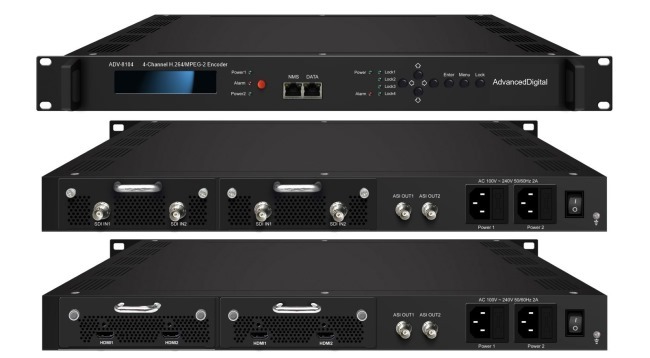 ADV-8104 - 4-Channel H.264/MPEG-2 HD/SD Encoder | AdvancedDigital Inc.
ADV-8104 is high quality 4-Channel professional video/audio encoder with powerful functionality. It has 4 independent encoding channels with a choice of SDI with embedded audio or HDMI with embedded audio inputs. It supports MPEG-2 and H.264 video encoding, and MPEG-1 Audio layer 2, LC-AAC, HE-AAC and Dolby Digital AC3 audio encoding. ADV-8104 has 2x ASI outputs and an IP output port. Four encoding programs can be output as either 4x SPTS or one MPTS.